Frankfurt reminds me of Philly. There is the downtown with skyscrapers, but much of the housing is 5 stories or less. Lots of green, lots of parks. Relatively easy to navigate the city. It has a comfortable feeling. I continue to get settled. Yesterday I actually made a cake - I had ingredients and bakeware sufficient to the task. I invited a few people over to share it with me ... Given that I own 8 plates right now (4 big and 4 small) and the cake itself inhabits one of them, it is a small group. I'm not 100% sure I have drinking vessels for all. Work is both harder and more rewarding than I had expected. My expectation is that I won't be getting bored any time soon, which is just the way it should be. My colleagues are smart, patient, and fun to work with. The last weekend of each month, the museums have free admission. I used that opportunity to explore a couple of museums and check out the touristy area - the museums are in the neighborhood - and have to admit the scenery is indeed charming. 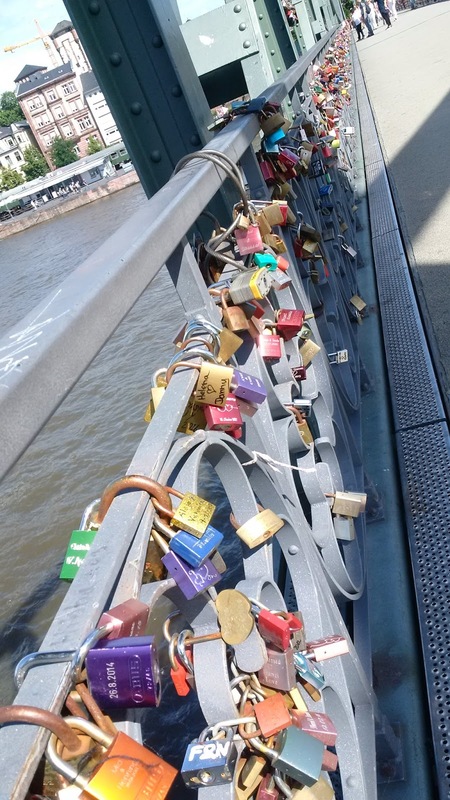 And the main tourist bridge has, as so many European bridges do, a slew of locks, most of them engraved with names and wedding dates, and in various colors. This weekend I ventured to a farmer's market. I have complained quite a bit about DC area farmer's markets - they seem to be Whole Foods outside and maybe even more expensive than WF if that is possible, whereas everywhere else in the world the purpose of a farmer's market is to cut out the middleman store, which gives the farmers more income while also reducing the grocery bill for shoppers. This market is more like that, the prices were pretty similar to the regular grocery store but the quality was better, so the shopper still gets good value. I found the first fresh beets I've seen in Germany, this year's crop and with the tops still on (once I saw a couple of leftover beets, dirt still on them, looking old and rubbery). I bragged to Terry about the beet greens I'll be cooking up this week. Last weekend I checked out a "street food festival" that was basically a food truck mashup. The Filipino adobo chicken I had for lunch was so tasty I went back for something new at dinner time ... the Balinese stand I had my eye on was sold out of food so I had one of the best falafel sandwiches I've ever had instead.